Ricky Tims has successfully blended two diverse passions into one very unique and interesting career. His skills as a pianist, composer and producer have been evident by the thousands who have heard his music. His success as a quilter is equally significant. He is known in the international world of quilting as a best-selling author, enthusiastic and encouraging teacher, an award-winning quilter, fabric designer, and a talented and spellbinding speaker. His innovative and entertaining presentations, feature live music and humor combined with scholarly insights and wisdom. His quilts have been displayed worldwide and are highly regarded as excellent examples of contemporary quilts with traditional appeal. Ricky's has made quilts that have won numerous international awards. He began designing and making quilts in 1991, and was recently named as one of The Thirty Most Distinguished Quilters in the World. In 2009 he was selected (in a three-way tie) by the readers of Quilter's Newsletter Magazine as The Most Influential Person in the Quilting Industry. in 2008 he was profiled and featured on the popular television news show, CBS News Sunday Morning with Charles Osgood. 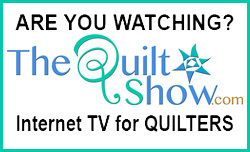 He maintains an extensive international schedule of teaching and speaking engagements, is co-founder and co-host of The Quilt Show (www.thequiltshow.com) with Alex Anderson and Ricky Tims - an online, subscription-based TV show for quilters. 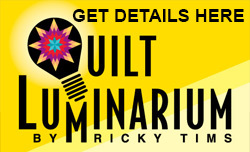 He presents three-day Ricky Tims Super Quilt Seminars in select cities throughout the United States and holds week-long La Veta Quilt Retreats at his art quilt studio in tiny mountain town of La Veta, CO. In 2010, he and Alex Anderson started a new quilting lifestyle magazine called The Quilt Life (published by AQS). 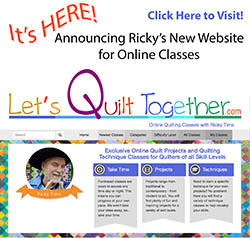 Ricky is passionate about quilting, and is delighted to share his experience and enthusiasm with quilters of every level of expertise. He is challenged by creativity in all forms, and encourages individuals to cultivate self-expression, reach for the unreachable, and believe in the impossible. Quilting is a relatively new interest compared to Ricky's lifelong passion for music. He began formal music lessons at the age of three. He is a pianist, conductor, composer, arranger, music producer, and performing artist. His music is neither classical, new age, pop nor world, and yet it could fall under any of those classifications. Ricky is proud to have implemented and conducted the 1998 concert When We No Longer Touch featuring the St. Louis Voices United Chorus and members of the St. Louis Symphony Orchestra. Passage, the CD recording of this unique concert was released in December 1998. He has also produced several solo piano recordings. His blend of music and quilting is unique and remarkable.